When the Internet came along in the mid-1990s, entrepreneurs and small business owners discovered they could level the playing field by adopting "inbound" marketing; i.e., attracting qualified leads by using online marketing to "pull" people toward information and resources to fulfill their needs. “Outbound” marketing still has it place, depending on the industry and marketplace. But if your business still doesn’t have a plan for “inbound” prospecting, then you are losing sales every day you delay. What Are the Components of Inbound Marketing? 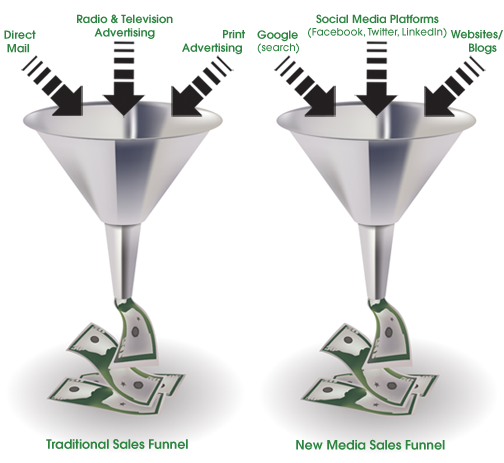 As you can see by the two sales funnels above, traditional and new media sales funnels both have the same goals: qualified leads and more sales. Because the sales funnel on the right uses ”inbound” information from digital resources, your business has tremendous new opportunities to leverage sales without traditional big-budget worries. “Inbound” marketing as created a tidal wave of change in how people connect with business. More than 50 percent of Google searches are for local business. It’s official: The Yellow Pages print directory is obsolete. When a consumer begins to research a purchase, the search starts online. Social networks like Facebook and Twitter have groups sharing interests about every imaginable topic. If you’re not there to share in the conversation or at least have a business page, then your company doesn’t exist for these like-minded people. If you don’t have a website—the most basic business presence you shouldn’t be without—then your company doesn’t exist. Period. If you don’t already have a plan to succeed using “Inbound” marketing, you need to get serious about it right now. Because chances are, your competitors are stealing your customers. — Search engine optimization strategies. Increase your site traffic, generate leads, and convert them into customers. — Email marketing strategies. Share knowledge and information about your business/industry. Grow your list of followers. Build your prospect list and land more sales. — Blogging strategies. Post timely, relevant articles. Interact with your customers. Build your reputation as a “go-to” authority in your industry. — Social media management. Plant your flag on major social networks. Create a reputation as an influencer. Gather your “tribe” around the campfire and tell them your story. Contact us or call (414) 771.8906 to learn more about how we can help with online marketing strategies and execution. Special offer: The first hour of consultation is free!